Yellowstone National Park’s boundaries are in Idaho, Montana, and Wyoming. It sits on North America’s largest supervolcano: The Yellowstone Caldera. Witness the ancient grandeur of her geysers Old Faithful, Beehive, or the world's largest: Steamboat. Eruptions of superheated water from 1200+ formations beginning deep beneath the earth’s surface have occurred regularly for millions of years, and 400 geysers put on a show for visitors each year. Flora and fauna are abundant, ranging in size from the microscopic archaea to large and beautiful Engelmann spruce trees. Petrified forests give yet another witness of just how long this landscape has supported a wide-ranging biodiversity. 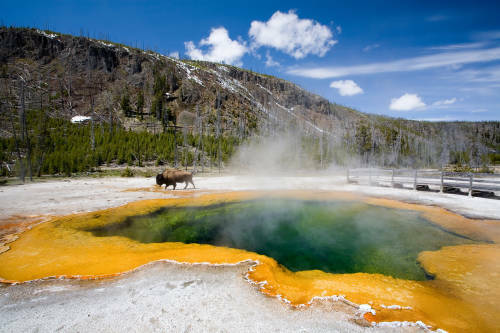 There are many options for touring Yellowstone National Park, some easy and others ambitious. Take a walk guided by park rangers to see the geysers, animals, and plants that populate the park, a private bus tour to easily cover a lot of ground, or a winter snow machine tour to see ranging bison. Come whenever and however you can to journey through time, and discover the ancient treasures of Yellowstone National Park. Yellowstone Under Canvas luxury tent camp allows you to unwind and relax in comfort and style while basking in the beauty and splendor of nature. Hibernation Station - located in the town of West Yellowstone Hibernation Station is ideal for large families and honeymooners. These luxury cabins offer visitors amenities such as fireplaces, kitchenettes, and televisions. Enjoy world-class fly-fishing and the breathtaking scenery of Yellowstone National Park. No matter what season you book your Yellowstone National Park lodging, Hibernation Station has accommodation packages to suit your needs. For those looking for a true Montana ranch experience while also staying close to Yellowstone National Park, Bar N Ranch is the perfect lodging option just 7 miles from the west entrance of the park. The 200-acre ranch exudes luxury yet boasts a rustic, ranch atmosphere and beautiful vistas. With larger, family-style cabins and great on-site amenities, Bar N Ranch is a perfect getaway for families venturing out to Big Sky Country. The Golden Stone Inn resides in the town of West Yellowstone, just minutes from the west entrance of Yellowstone National Park. The Golden Stone Inn is a new cabin accommodation featuring a mix of rustic, traditional, and contemporary design and decor. For either the individual traveler, the couple on a romantic getaway, or even for a small group, the Golden Stone Inn provides a restful experience near Yellowstone National Park. Silver Gate Lodging, located within one mile of the northeast entrance of Yellowstone National Park, provides rustic, clean, and affordable cabin lodging for those craving a scenic and slow-paced atmosphere to visit Yellowstone. While the cabins have a variety of bed configurations, all cabins have private bathrooms, and all cabins, except two, have kitchens. Moreover, to enjoy such a unique environment, there are either porches or firepits at all cabins with chairs. Silver Gate Lodging is definitely the place to be to experience an authentic Yellowstone vacation. The Yellowstone Gateway Inn provides luxurious apartment-style suites in the town of Gardiner, Montana, just outside the north entrance of Yellowstone National Park. Whether one is looking for a simple king room, one or two bedroom kitchen suites, or even a three bedroom house on the Yellowstone River, The Yellowstone Gateway Inn is unmistakenly the best value in Gardiner for either a brief one night stay or a longer extended stay. Yellowstone Valley Inn, RV Park, and Restaurant are located in Cody, Wyoming a brief ten-minute drive to Yellowstone's East entrance. Yellowstone Valley Inn offers friendly service, western lodging, exceptional food, heated pool, coffee shop, hot tub, and guest laundry. The is the perfect base camp spot to explore all that Yellowstone has to offer.